Update: The High School Report and the Infinite Campus proposal to increase usage are off the agenda due to time considerations. There is also a new Re-Organization Budget (appendix A) updated with corrected calculations showing different “savings” figures. Another very busy week with Madison Metropolitan School District governance matters. So busy that I’m doing a once over “lightly” (can’t really call something this long light) with this post and time permitting intend to post in more detail on some of the items such as the much-delayed and unacceptable Equity Report, and maybe the budget matters (five year analysis here , MSCR cuts and effciencies here and time-line here), the Reorganization proposal (memo, appendix one, appendix two) and perhaps others. You can access the entire week’s notice of meetings here. The week starts bright and early with a Monday, 8:00 AM visit from the Madison Legislative delegation to Falk Elementary School. This is something Board Member Maya Cole has been pushing. The idea is to bring those in control of school funding into the schools to witness and here about the difficulties their actions and inaction have created. Beyond actually getting the legislators there and listening, the key to success is to find the right balance between “we are doing a good job” and “the children’s education is suffering.” Professional educators have a lot of trouble with the latter. Here is a guide to a similar exercise from the Illinois Education Association, the key point they make is to stay on message. This is a Committee meeting week. Most items are first presented this week to the Board — meeting as Committees — for discussion and then return next week to the Board — meeting as the Board — for votes. The Committee meetings are consecutive and commence at 5:00 PM in Doyle Administration Bldg., 545 W. Dayton Street, Room 103. Like almost all Board meetings, these will be carried by MMSD-TV. Public appearances for all items and committees are at the start of the first meeting. This week, the first Committee is Planning and Development. 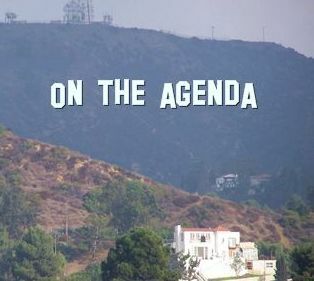 Here is the agenda. The big item is the Reorganization (memo, appendix one, appendix two). This is the first public look and it is listed as an action item for the March 8 meeting (the Board previously discussed some version or some aspects in closed session, the big problem with closed sessions is you don’t know what happened). There is a lot here and I have not had time to look closely, but will offer some initial observations. The big idea is to align the structure with the Strategic Plan. The “side by side” is nice, but comparative organizational charts would be useful too. You really can’t tell the players without a scorecard. What might be the biggest change is the adding Chief Learning Officer to the title of Deputy Superintendent and changing the duties and structure accordingly. I say might, because it is difficult to see how this will not continue to be a primarily administrative (as opposed to educational) position. Steve Hartley who holds the position now is retiring. I’ve heard nothing about who might be filling the revamped position next year. The other big change involves what is now Teaching and Learning. A new Department of Professional Development is being created, moving this out from under Teaching and Learning. Teaching and Learning will be re-dubbed Curriculum and Assessment. TAG moves to the Elementary and Secondary departments (I’m not clear on waht that means or who they will report to). The Special Asst. for Race and Equity becomes the Assistant Director of Equity and Parent Involvement, in the Curriculum and Assessment Department, with Cultural Relevance Resource Teachers and Minority Service Coordinators in the new division. The emphasis on Parent Involvement in the new name doesn’t jibe with the new organizational home. Come to think of it, it also doesn’t jibe with the definition of Equity in the district Policy (curriculum and assessment are only two parts of that and not — in my opinion or as reflected in the policy — the most important parts. In a related matter, the Affirmative Action officer will be moved Superintendents officer with duties involving Community Partnerships. Although Community Partnerships are being moved, the Public Information Department becomes the Public Information and Community Engagement Department. Partnerships to the left, engagement to the right? There are things going on with a “Cluster Program” that I’m not clear about. It appears to be about delivering central office support services via quadrants or clusters, but also appears to be headed by the a principal of Shabazz, with support by principals from small elementary schools and I’m not sure how that will work in practice. I think I’m missing something. As part of a related restructuring, Alternatives becomes Alternative and Innovative Programs, with some new duties for the director and day-to-day responsibilities for the students and staff of the programs housed in Marquette and Lapham devolving to those principals. This is another one that doesn’t feel right. MSCR will report to Asst. Sup for Business and Finance. I think this is to get control of things. The Lead Elementary Principal postilion has been axed, replaced by Director of Early and Extended Learning (4K, after-school, Summer…). The net cut is (I think) five administrative positions. Savings are in the $550,000 range (which as far as I can tell is the same range as the administrative raises recently given without a fiscal analysis or any discussion and not including the raise recently given to Supt. Nerad, also without a public discussion). The savings figure ($556,439.50) includes positions that have been eliminated but due to continuing contracts the personnel involved will remain on the payroll in temporary positions and the proposal calls for Fund Balance money to be used for their salaries and benefits. This totals $337,538.3, leaving a little under $220 Grand in savings for the 2010-11 budget. As the Board looks at the 2010-11 Budget, these kind of deceptive labels need to stop. A lot of people are being asked to do more, some with less to work with. Much, much more on rationales, leadership councils, renamed departments and positions…I get some of it, but am not clear on the what, or why with much. Next on the agenda is the Badger Rock Charter School Planning Grant Application. This looks unchanged from the last time it was before the Board. This Committee closes with the Lindbergh Elementary Community Garden Proposal. This looks great. More on school/community gardens here (with music!). Operational Support is next (agenda linked). Any good feelings lingering from the garden proposal won’t last long as the Board takes up the Five-Year Financial Outlook to include Projected Budget Gaps and Tax Impacts. No smiles here. These are with 4K. That’s about $19.5 million in savings, efficiencies, program and service cuts over four years (on top of whatever is saved/cut in 2010-11). Yow. The projected levy and tax impact numbers are another “yow.” Some of these come in with 4K and without 4K versions. These don’t reproduce well, so some just selected parts, figures and notes. One interesting thing is that they are based on an assumption of no property wealth growth. My guess is that property wealth in Madison will continue to grow slowly (easing the burden on individual taxpayers), but will grow faster than the rest of the state (leading to cuts in state aid). How this balances out, I don’t know except that recent history inclines me to believe that Madisonians will be hurt more than helped. In the “with 4K” projections, if the district taxes to the max and the deficits are met with Fund Balance spending and not cuts etc, the district goes broke in 2014 (no “without 4K version on this one). Our younger son would be in Middle School that year. The current mil rate is 10.18 (on page nine of the linked document there is a fuller chart, with projections for homeowners that did not reproduce well enough to post). These are huge tax increases. Talk about unsustainable. Insert obligatory Wisconsin Alliance for Excellent Schools and Penny for Kids links along with discretionary School Finance Network link. Next up is MSCR Proposed Budget Reductions and Efficiencies for 2010-11. There is much here. 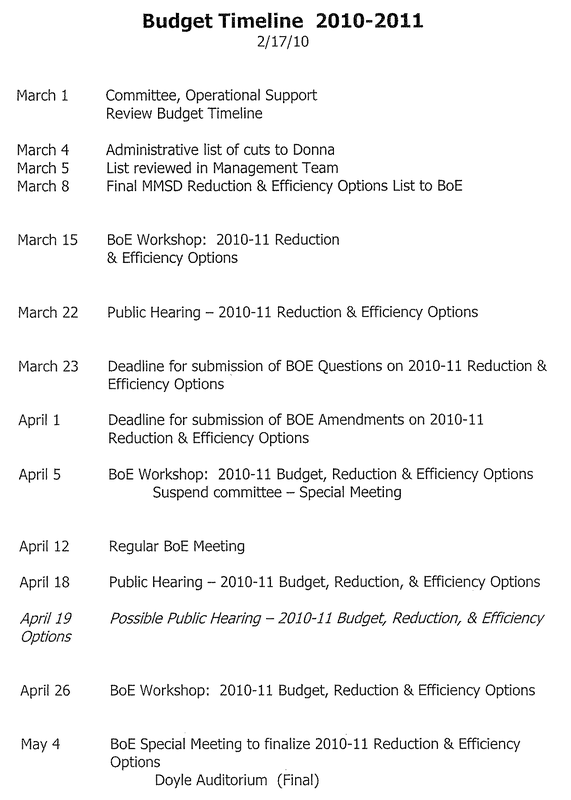 ; position cuts, schedule changes to save overtime, program cuts, fee increases…much. MSCR is an orphan. Some with the school district believe that it is outside the “core mission” and this is true if you look at the strategic plan. It isn’t true if you look wider and note that MMSD has accepted the taxation authority and responsibility for providing recreational programing. I wish there was a Parks & Recreation Department in Madison (not necessarily under Kevin Briski), but there isn’t. There is a hodge-podge and some of it is the the responsibility of the district. Quality of life in Madison depends in part on a wide variety of recreational activities accessible to all and like other quality of life matters this means that it is proper for tax dollars to be used to create and to some degree subsidize these activities. There are a couple of places in the document with asides like (paraphrased) “based on fees, more like the YMCA” or “maybe the Boys & Girls Club will do something.” To me this is shirking responsibility. Maybe not in every case, but as an attitude. My impression is that there are real savings and efficiencies to be found, some justifiable cuts and fee increases, but a real need to keep opportunities and keep them affordable for all. Discontinue after-school contract for low income at Red Caboose and YMCA (my note: the variety of after-school programs and varied costs of these needs to be addressed). Reduce School Year and Summer Transportation (my note: all good, except many parts of the city have no or almost no MSCR programing, I’d like to see this addressed also). Increase staff to student ratio by 2.5%. Shift Safe Haven Fee Waivers to Dane County Childcare Assistance (does the County know? Robbing Peter to pay Paul?). Reduce Fee Waivers (adult and youth). Raise Program Fees (some big and OK, some small, some seem too big). Discontinue Safe Haven at Lindbergh (this isn’t sitting well with that neighborhood). Take a look yourself, but do keep in mind that if we want Madison to be a rich and attractive place to live, part of the price is public support for the things MSCR provides. Next, Proposal for a Lease and Contract to Permit the Construction of a Cellular/Communications Tower on Gompers/Black Hawk Property. Then it is time for Approval of the “Resolution Authorizing the Issuance and Sale of $28,590,000 Taxable General Obligation Refunding Bonds”. This is the retirement refinance/4K finance voted on here. It looks like an intense and unpleasant couple of months. Everything else is Bills, Purchases and Contracts, Other Financial Transactions as well as the Human Resources update, (with lots of retirements, including Debra Stanko who did more than right in recognizing and addressing our older son’s talents and needs at JC Wright). Among these, the Formative Classroom Assessment Tool Development and Data Sharing Agreement caught my attention and not in a good way. The contract is with UW to pay a Grad Student to develop an I-Pod Touch assessment app. Do we need this; do we want this? The only reason that I can see to have an assessment app on a handheld device is to be able to assess while teaching, to enter assessment data while walking around the classroom. I want my teachers in the moment, teaching. This is the current obsession with data over teaching in a nutshell. If this is the future, I don’t like it. The last meeting is the Student Achievement and Performance Monitoring Committee. The first item is a Madison School & Community Recreation (MSCR) After School Programs report. This and other reports on MSCR should inform considerations of the proposed changes discussed above. Then it is time for the long awaited (well over a year and a half late) Annual Equity Report. A full consideration of this will appear in a subsequent post. My initial impression is that there is one part part I think is based on a very good concept, but overall it is more than a day late and more than a dollar short. The lateness and shortness are related significant failures. The idea was to measure progress or document the lack of progress and the not only has much time been lost in setting the benchmarks, but the shortness has to do with the reports failure to provide those very benchmarks. First the part I like conceptually. The final portion of the report takes strategies recommended by the Equity Task Force and links them to things the district is doing, “Programmatic Resources.” . This is very interesting and useful. I’ve got some doubts about some of the links and there is a certain impression of “we’ve got this covered” that can lead to complacency where urgency is needed. Still I like the idea and much of the execution. Obviously with the first report, progress will be difficult to report (that timing issue again); because of the lack of specific measures it will also be difficult with next year’s (the shortness). At this time I’m not going to question the measures chosen for achievement, but rather criticize the presentation of the data related to these measures. There is no raw data, no analysis (statistical or otherwise). Instead we are given selected factoids (the State of the District presentation which serves as the basis for much of the report suffered from a similar lack of information and rigor). For now a couple of examples will suffice. At least here there are some numbers. There is no there, there. Factoids. Nothing to work with. In terms of resources, we are given explanations of the Equity Resource Formula and Title I, but no “data” on how these are distributed “across all schools.” Information is similarly lacking in other areas: the goals of the Technology Plan are presented with an Equity framework (good), there is no information on the technology in or slated for particular schools and how that related to Equity (bad); The School Improvement Process is sketched and funds are mentioned (good), but there is no accounting of those funds (bad); Professional Development and Indigent Bus Passes are also mentioned. More than a dollar short. As I noted, I’ll be returning to what is and is not here in a subsequent post (see here for an earlier related post). In closing this topic, I was recently reminded that the Board accepting a report is not the same as approving it. I understand that, but think that this report should not be accepted. It is unacceptable. It does not meet the requirements of the Policy by any stretch of the imagination and does not provide a basis for assessing the future success or failure of the district’s Equity work. We’ve waited long enough and can wait longer if we must; there is no excuse for not doing this right. The High School Initiatives agenda item has much of interest on the REal work, the ACT/Eplore initiative, AVID, and the Individual Learning Plan implementation. I’m not sure how much is new here and don’t have time to dig tonight. The action items are Recommendations to Increase Usage of the Infinite Campus Student Information System, Renewal of DPI Waiver for Days of Instruction for Sixth and Ninth Grade First-Day Transitions, and Five-Year Education for Employment Plan (precursor to the first and the last were covered in previous “On the Agenda” posts). Consent items are Learning Materials purchases, 57 High School Diplomas and the enrollment of students in Equivalency programs. The other meetings this week are the Common Council/BOE Liaison Committee, Wednesday 5:30 PM at the City/County Building and the Superintendent’s Human Relations Advisory Committee, Thursday, 1:15, Doyle Building room 103 (agendas on the Weekly Notice).